Lenovo T1050- Toploader Laptop Bag - Black - 888015205 - Notebook Sleeve - 15.6""
The modern Windows 10 Pro 64-bit COA operating system from software developer Microsoft is already bundled with drivers Lenovo ThinkPad T450 included. The product can therefore be used directly after the purchase and the user is spared the need to make further driver installations. 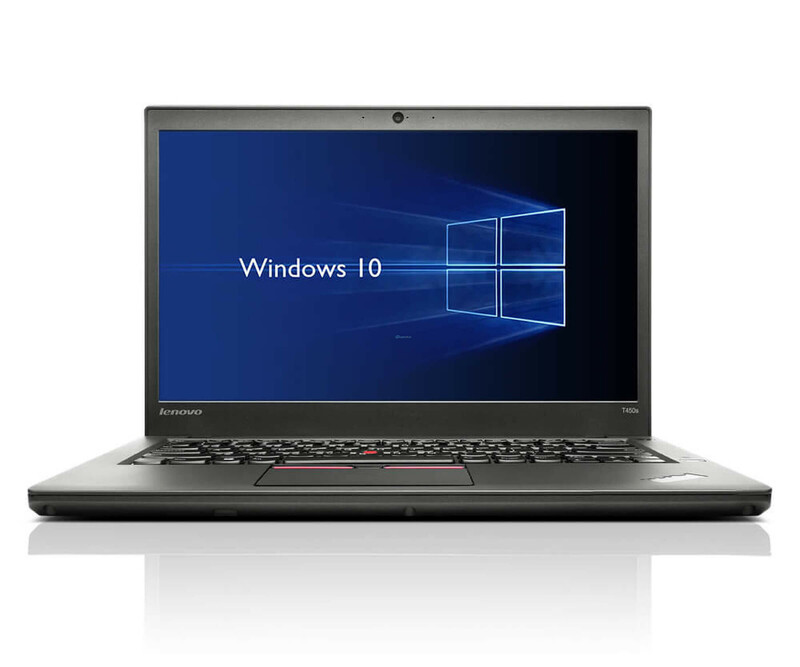 The modern Windows 10 Pro 64-bit COA operating system from software developer Microsoft is already bundled with drivers Lenovo ThinkPad T450 included. The product can therefore be used directly after the purchase and the user is spared the need to make further driver installations. In addition, a powerful processor Intel Core i5 fifth generation is integrated into the device of the Chinese manufacturer. This laptop is a so-called Ultrabook, that is a very thin and light device. Thanks to the dimensions of 33.1 cm x 22.6 cm x 2.294 cm, the product is optimally suited for transport in a laptop bag or backpack. So the user can use the Ultrabook on the go, in the office, but of course also from home. The Lenovo ThinkPad T450's fifth-generation, powerful, modern Intel Core i5 processor comes with 64- Equipped with bit computing. This processor is a so-called dual core processor, which is composed of two cores. Thus, a higher computing speed can be achieved. The speed of the processor per core is 2.2 gigahertz. At full capacity of both cores, a whopping 4.4 gigahertz can be achieved. Thanks to the modern Intel Turbo Boost Technology 2.0, the computing power per core is once again increased to 2.7 GHz, so that a total of 5.5 GHz can be achieved. The Random Access Memory (RAM) with DDR3L SDRAM technology operates at a speed of popular 1600 megahertz and has a total of 8 gigabytes of data caching. This ensures smooth execution of applications and programs. The form factor is 204-pin. The Serial ATA-600 hard drive has a whopping 256 gigabytes of storage space for storing files such as documents, videos or photos and has the latest SSD technology. The S-ATA hard drive works at a fast 6 gigabytes per second. Lenovo's product's display is in the usual 16: 9 widescreen format. With the resolution of 1600 x 900 (the HD + format), content is razor-sharp and the user can enjoy videos and movies in impressive picture quality. With a screen diagonal of 14 inches (35.5 cm), the display of the ThinkPad T450 can be assigned to the smaller notebooks. A special feature is that this screen is a glare-free display. This makes it possible to view the contents from different positions. It's also worth noting that this is a built-in Intel HD Graphics 5500 with regard to the product's graphics card. The device's user interface includes a stereo speaker and a microphone. 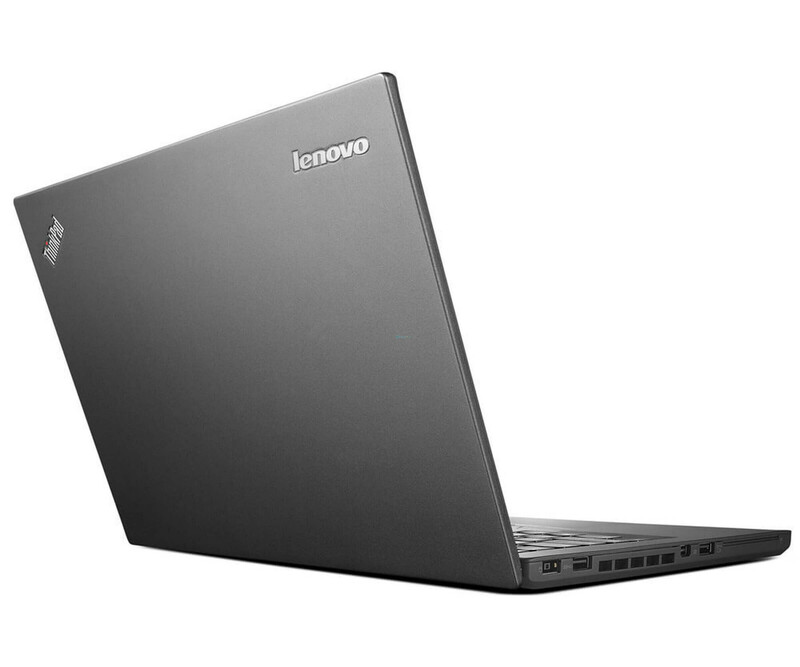 In addition, the user has the opportunity to connect another microphone or headset with the Ultrabook from Lenovo. The touchpad has the modern multi-touch function, which facilitates the control of the mouse cursor. Furthermore, it is a liquid-resistant keyboard. Wireless connections, for example to the Internet but also to the local corporate network, can be made using the Intel Dual Band Wireless-AC 7265 - M.2 Card wireless controller. In the event that wireless connections are not available, a wired connection can be made via the traditional Ethernet controller. 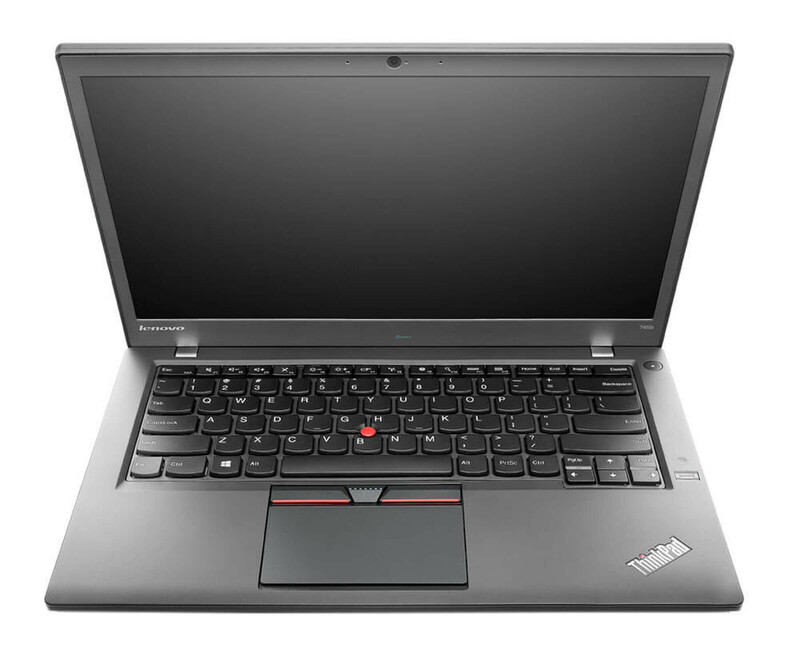 The Lenovo ThinkPad T450 has three interfaces of modern USB 3.0 for a particularly fast transfer of files to removable media such as USB sticks. Using the traditional VGA port or built-in MiniDisplayPort, users can connect Lenovo's product to other display devices, such as televisions, and enjoy content on a large screen. 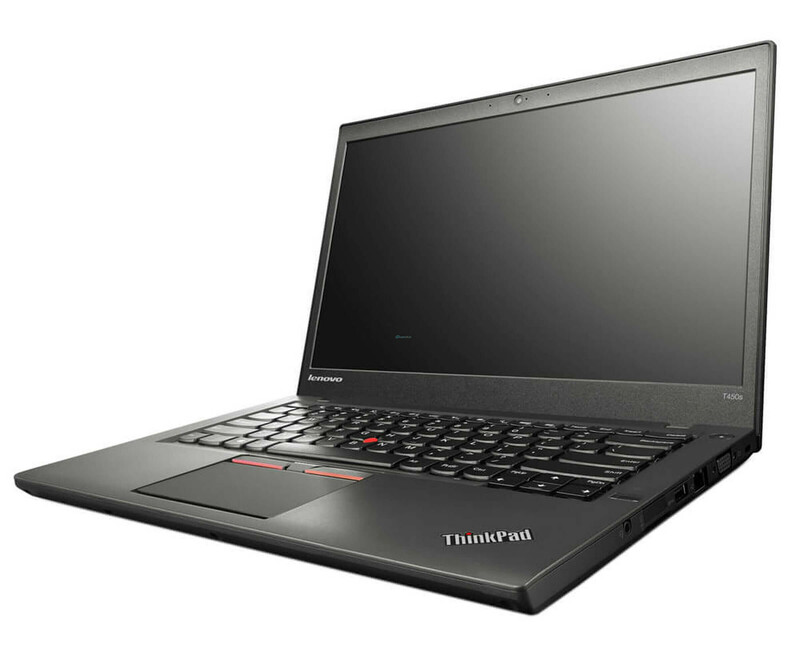 The Lenovo ThinkPad T450 protects the sensitive data of the user with a hard disk password. It is also worth noting that a slot for a security lock is integrated in the product. This protects the device against theft in the workplace.